Photo above: The piece Essence is made of cast iron and glass. 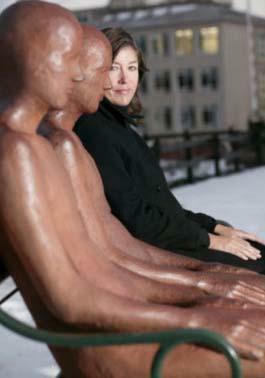 The two figures are of the same cast and look towards each other. In the chests very small glass inserts have been placed. 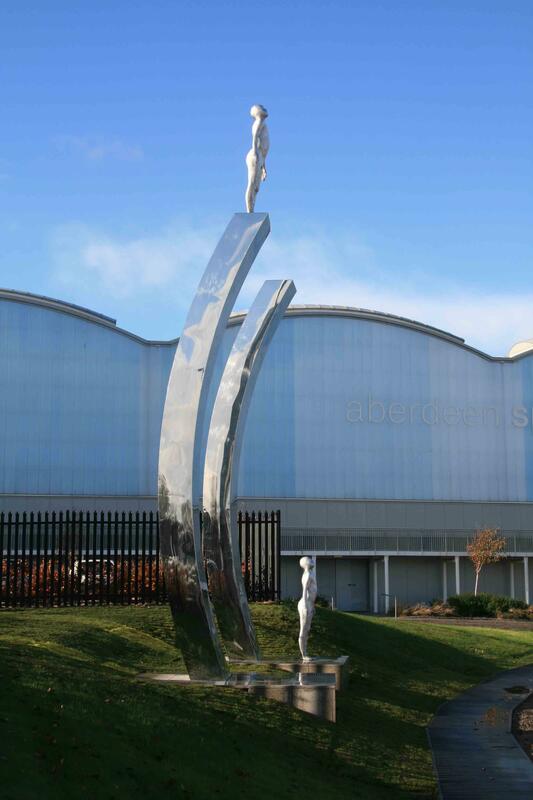 They open the figures up to the daylight and connect the figures to one another as well as making a kind of focal point in the piece. Placing them looking towards each other brings in a dynamic relationship within the work of art. The photo is taken in Rauðhólar (Red Hills) just outside Reykjavík. The piece is now in a collection in Liechtenstein. 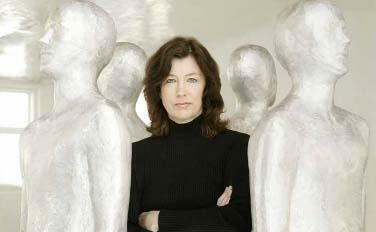 The renowned Icelandic sculptress Steinunn Thórarinsdóttir was born in Reykjavik, Iceland in 1955. She creates figures, confrontational, provocative, proud but at the same time modest personalities. Tall, androgynous figures, placed in gardens, streets, woods, on squares, fields, airports. Anonymous figures, with closed eyes, and no ears. Figures that seem to be whispering. Are they friends, helpers, witnesses, accusers? Steinunn invites, provokes people to participate in her art, but she likes to leave the work open to interpretation. Steinunn Thórarinsdóttir lived and studied art in England (Portsmouth) and Italy (Bologna). 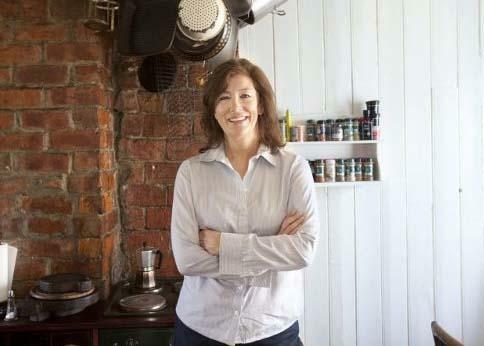 Steinunn:"Living in Italy, is like living in a museum." In England she started at the age of 19 and later in Italy she continued her training as a sculptor. In England her teacher was the well-known sculptor Darrell Viner. After her studies, she has been working professionally for over 30 years and has exhibited widely in Europe, Japan, USA and Australia. At the moment she has two exhibitions on in the US: Horizons, in the Birmingham Museum of Art in Alabama and Borders (see below) is running in Chicago through spring 2014. Also she has a gallery show in the Tveir Hrafnar Gallery in Reykjavik, Iceland. In April 2014 she will have an exhibition in Vancouver, Canada. She has received numerous awards for her art and her works can be found in private, public and corporate collections all over the world. She works in various forms of sculpture and uses many different materials for her artistic expression. Through the years Steinunn has done numerous commissions both indoor in specific spaces as well as site-specific outdoor work. Steinunn lives and works in Reykjavik, Iceland, and has two (artistic) sons: Thórdur Ingi Jónsson (20) and Thórarinn Ingi Jónsson (31). The older son, a visual artist who just finished his MA degree in Prague, has been the model for her sculptures since he was 14. Her younger son is becoming a musician; he studied piano for many years and now he is making electronic music. Experts claim that although her work is installed at different places all over the world, where they fit in well, they have their roots in her 'volcanic' homeland: Iceland. The fact that her son stood model for her figures also implies a kind of connection with her home, her land, her family, her soul. And although her figures look anonymous and have no ears and have closed their eyes, they might hear and see everything. Steinunn explains her attitude in art: "I am not afraid of my own strength. I am also a very individualistic person, and have always been. I just try to do, what is natural for me. And the atmosphere and landscape of Iceland have had a strong influence on my work, which is both organic and volcanic and at the same time spiritual and calm. For me it is also important that the work itself is not intrusive and aggressive and that people feel they can approach the work. I want to make people stop and think, which is very important in today's fast-paced world." 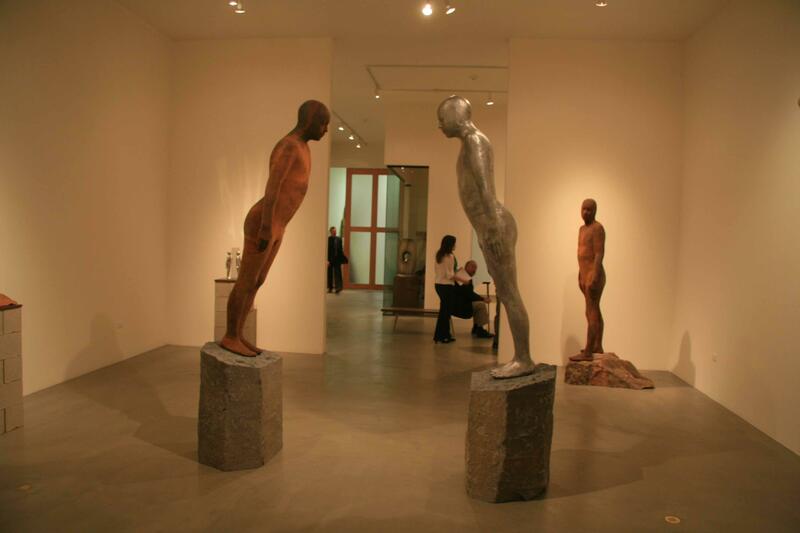 The two figures of the artwork Shadows (photo below) lean towards one another without touching. They are identical but facing opposite directions and the bond between them seems somewhat superficial. This symbolizes man´s need to turn to others for support but also indicates that when it comes down to it, each man must struggle for himself. This installation (photo right) is called "Lights". It comprises five cast iron and glass figures. All the figures are different. The glass inserts are round and of different sizes, a little bit reminiscent of when you see the sun shine through leaves of trees in a flickering way. They are circular like the sun. The glass inserts unite the five figures. The rusty colour connects the figures to the earth. The installation is now in a collection in California, USA. Steinunn Thórarinsdóttir’s exhibition called Encounter in Scott White Contemporary Art Gallery (2011, California). Encounter is a colossal cast iron, aluminium, and basalt sculpture, and served as the focal point in the gallery, setting the tone for the exhibition - radically altering its immediate surroundings with its unforgettable scale and presence. The exhibition Encounter in La Jolla, California, showed life-size figurative artworks made of cast iron, steel, aluminium and glass, inspired by the Icelandic landscape. It was Thórarinsdóttir first solo exhibition in California. A 26 piece public installation as seen in Dallas (2013), after the exhibition has been shown at Dag Hammarskjöld Plaza near the UN Headquarters in New York City (2011), and Seattle (2012). At the moment the exhibition is on view in Chicago. In 2014 the exhibition will be shown in the Brauer Museum in Indiana (USA). 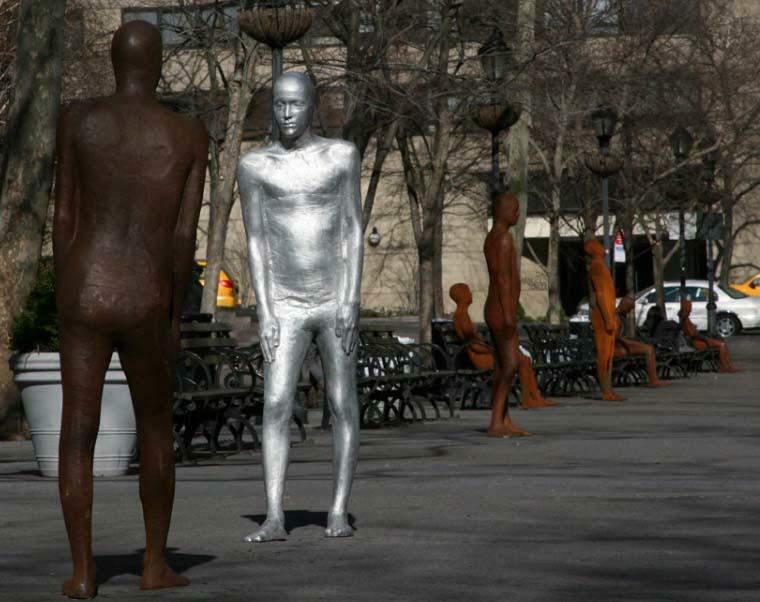 Icelandic artist Steinunn Thórarinsdóttir created 26 life-size human sculptures for a public art exhibition, entitled “Borders,” which was held in Dallas, New York and Seattle. 26 figures (13 pairs), anonymous again, but omnipresent. They were installed as a kind of border, that people can cross. Although of human shape and proportions, with arms and hands, again, as in most of Thóransdóttir's art, the eyes of the figures are closed and ears are lacking. 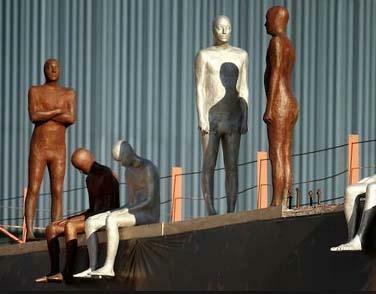 The faces are expressionless, the bodies genderless, their surfaces alien and coarse. Comprising two types of sculptures — one of silvery, gleaming aluminum, its ethereal surface reflects air and the sky, the other of rust-stained iron, its texture rough and raw as earth. Each aluminium piece weighs 180 pounds; each iron piece weighs 440 pounds. Thórarinsdóttir, who sometimes “stands and peeks” at passers-by, said she enjoys watching her art evoke different reactions from people. That's the fundamental idea of the exhibition: Viewers make what they want of it. The pieces can be poked, stroked, cuddled — so long as the art stimulates some kind of mental and physical response, Thórarinsdóttir said she considers her mission accomplished. Her artwork, which took two years to complete, was first installed in 2011 at Dag Hammarskjold Plaza by the United Nations Headquarters in New York City. A multicultural and international site. Thórarinsdóttir said she consciously placed her figures in that socially and politically charged environment, and her choice to install them in Chicago's Solti Garden was just as careful and deliberate. The site is next to the Chicago Art Institute and Millennium Park, one of the best-known places for public art in the USA. Days before “Borders” was installed, she sat on one of the garden's benches for hours considering how her sculptures would fit into the surroundings. She recalled listening to the languages spoken by people of all sizes and colours, and she knew she had found her gallery space. “I wanted the installation to relate to people by emphasizing that wherever we come from, whatever our life experiences are, we're all connected in shape and spirit, ” she said. Thórarinsdóttir purposely left her androgynous figures “neutral.” Some may be sitting, a couple kneeling, others standing, but their faces are left enigmatic. Her Icelandic background influenced her philosophy, she said: “Iceland is an island with lots of space, very few people, surrounded by a volatile and unpredictable nature. So in Iceland there is a strong feeling, that what you are, what you do, matters. 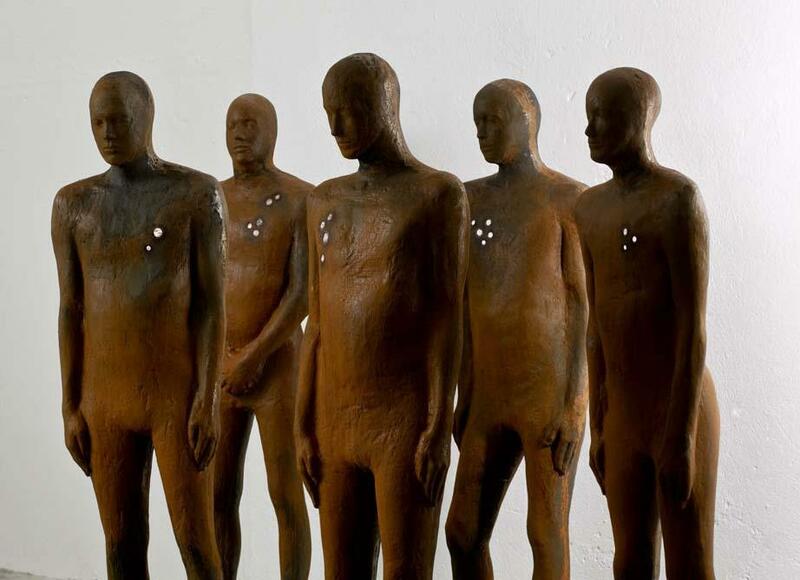 We are individuals, but we are also all connected, we are all part of humanity.” This particular work is also partly familiar: Steinunn Thórarinsdóttir based all of her sculptures on her older son's body. She says, jokingly: "He was my victim." In 2004 Steinunn Thórarinsdóttir had an impressive exhibition in the capital of Iceland, Reykjavik. It was a solo public show at Hallgríms Square. The show was extended twice due to the popularity on this most visited spot in the city. 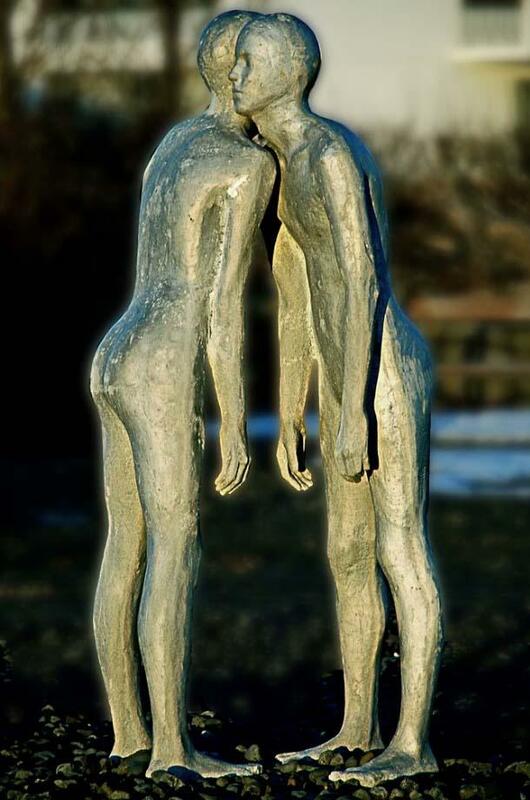 The revolutionary sculptress Steinunn Thórarinsdóttir is internationally recognized and celebrated for her use of cast iron, steel, aluminum and glass to create life-size figurative works. These anonymous-looking figures are often installed to give the feeling as if they are part of the landscape where they are placed. Although figurative, her forms have a deliberate lack of definition that is emphasized by her choice of materials and the sand-casting method she employs. Steinunn Thórarinsdóttir uses life casts consciously in her artworks. She casts alternatively in iron, aluminium or cement and also uses clay and glass.